In order to access the content of a binary file as structured data, load the appropriate structure definition file and map the structure definition to the binary data. The Structure command performs all operations related to structure definitions. The left pane displays the list of currently loaded definition files (a checked box specifies the corresponding file should be autoloaded at program startup). The right pane lists all definitions in the selected definition file. In order to create a structure mapping at the current position select the structure and press the Map button. Each definition file creates a different namespace. This means that the same structure name may be used in several definition files. No error occurs as long as the name is not duplicated within the same file. 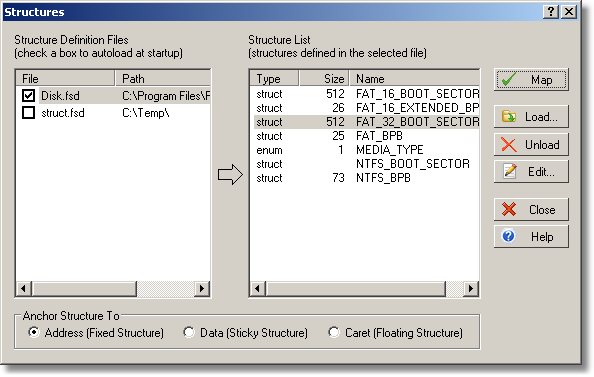 The structure size is not shown if the program is not able to calculate it. The most probable reason for it is the structure contains a variable size field. Fixed - The structure is attached to the current address. No matter how the data changes, the structure position is always remains the same. This is the default anchoring type. Sticky - The structure is attached to the data block in the current position. If the position of the block changes as the result of some insertion or deletion operation, the structure's position is changed accordingly. Floating - The structure is attached to the caret and moves with it. A small pop-up window shows the structure data, and is updated every time the caret moves. Load - Loads the specified definition file and makes its definitions available for mapping. Unload - Removes the selected definition file and discards its definitions. Edit - Opens the specified definition file in an external text editor. The Windows Notepad is used by default; you can specify another editor in the Settings dialog. Please note that FlexHEX does not reload modified definition files automatically.